On November 21, China signed the Shanghai Declaration to achieve the health and well-being goals of the United Nations 2030 Agenda for Sustainable Development. The declaration was signed during the 9th Global Conference on health promotion. Over 100 city mayors, heads of five United Nations agencies, more than 40 ministers of health and other sectors and the Prime Minister were present at the signing. The declaration stressed on the importance of universal health coverage and the need to better address cross-border health issues. 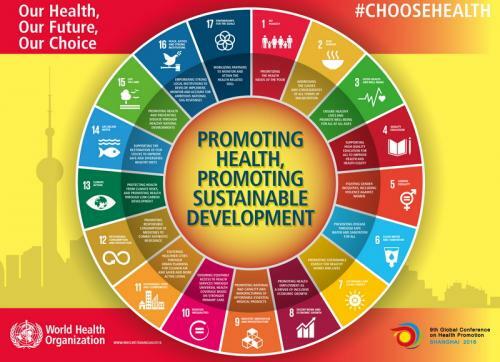 It has included the role of good governance and health literacy in improving health in its commitments to meet the 2030 Agenda. It also highlighted the need for people to be able to be in control of their own health and be in a position to make healthy lifestyle choices. China, in the declaration, has resolved to use government mechanisms to protect health and promote well-being through public policies. It aims to increase taxation and strengthen regulation of unhealthy goods. The declaration encourages investment in healthcare and commits to establish policies that benefit both health and well-being and city policies. The Shanghai Declaration resolves to provide equitable health care opportunity to all while preventing degradation of the planet. Chan states, "Legislative and fiscal measures are among the most effective interventions that governments—national and city—can take to promote the health of their citizens, from tobacco control and taxing sugary drinks to ensuring people can breathe clean air, bike home safely and walk to school or work without fear of violence." All of the commitments made during the conference resonate with the five P’s mentioned in UN’s agenda—people, planet, prosperity, peace and partnership. In September 2015, the United Nations came up with the 2030 Agenda for Sustainable Development that included various social sectors for instance, reduction of poverty and hunger, improved food security, sustainable agriculture and health among 17 other sustainable development goals.